Today I'll be interviewing Jacob about Gunnerkrigg Court, one of our favorite books/webcomics. Alysa: So. Gunnerkrigg Court. It's pretty good, huh? 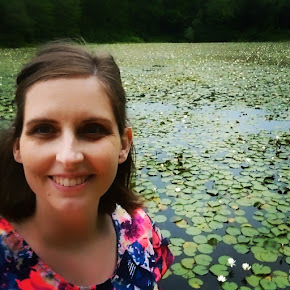 Alysa: Why don't you tell the blog readers how we found it? Jacob: That's not a question. But I can. Alysa got the first book of Gunnerkrigg Court for the Cybils...last year?... or I guess it was two years ago when she was on the Graphic Novels panel she read it and really enjoyed it and told me I had to read it. So I did. Then we found out there was a web comic. Jacob: That it is a webcomic, caught up to the current storyline and both have been following it via Google Reader ever since. Alysa: If I recall correctly, we were reading it pretty much non-stop for several days. Jacob: I'm waiting for the next question. The first two have not been very good, as questions at least. One ended in "huh?" and the other was less of a question and more of a command. Alysa: Umm, ok. What literary themes have you identified in Gunnerkrigg Court? Jacob: Now I feel like I'm back in High School English. But that was a much better question. The main theme...is...the conflict between technology and the natural world. Which is shown through the conflict of Gunnerkrigg Court and Gillitie Wood. A: How do you spell Gillitie wood? J: I dunno. I'll have to find out later. Are you going to go back and edit this at all? A: Yes. Yes I am. 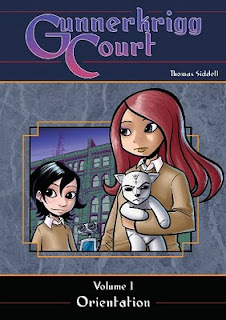 typos everywhere since I'm transcribing as we go Gunnerkrigg court is the school that Annie goes to. Gillite wood is the big scary woods on the other side of the ravine/river/bridge. J: There's also the usual themes of growing up; it's a coming of age story. A: Yeah, she's finding out about her parents more, Gunnerkrigg Court is a boarding school, and her parents used to go to it. J: But it's not like Harry Potter. A: Right. There's no real bad guy as far as I can tell. It's just a series of chapters, experiences that Annie and her friends have. J: There's also themes of friendship, and trust. And loyalty. J: Hey, I thought we were doing something. A: We are. We're creating something together, that is not a baby. J: You just want to be able to include that line. A: What can I say? It's a good one. A: Ok fine. To whom would you recommend Gunnerkrigg Court? Or, have you recommended it to anyone already? J: Ummmm I would recommend it to most anyone. Over the age of.. 12 would you say? J: Right. One of the things I like about it. Is that it has interesting themes and ideas without needing to resort to that sort of stuff. ... AND there's City Face. Not actually part of Gunnerkrigg Court. But I'll leave you to find out about that yourself. A: One of the things that I think is kinda weird is reading it just a page at a time, as it comes out. J: It was much nicer to read it in book form. We would love to purchase Volume 2. (and 3, I don't think it's out yet though. The material is there, but it's not been published yet.) We're just poor graduate students, though. A: Yeah. It's not put out by a publisher. A: I think it's self-published. I mean, obviously there's still someone who publishes it. A: Yeah his style has changed a lot. And I think that the style of the story has changed too, over time. It has become more coherent. Cohesive. Less episodic? But maybe that's just the fact that I'm reading it one page at a time. J: If you do start reading it, be aware that there's not much exposition. And by not much, I mean none at all. A: The backstory comes later. In pieces. Which I like. J: It's all part of the mystery. ... Here's how you spell Gillitie Wood. A: corrects previous. Ok, cool. A: What are you laughing about? J: The first chapter. Annie's trying to figure out how to get Shadow 2 across the bridge but she couldn't walk across herself. And she says, "There was only one sensible resolution to the problem. I must construct a robotic walking device, which will provide you with transit across the bridge!" A: I like all the fun inventions. Like the laser cows. A: Ok! That's us signing off then! Tell us if you read it, and if you like it! Here's the first page. Oh! I wanted to tell them about how when we went out for Valentine's Day, dinner without the kids, we spent a good deal of time discussing our Gunnerkrigg Court theories. That was fun. J: I see... still paging through Vol 1...Jones! You guys crack me up. Can I borrow the first book? but of course! just don't let me forget.